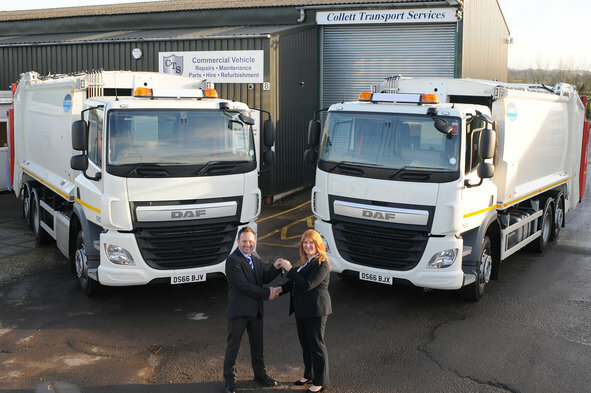 Municipal Vehicle Hire company Collett Transport Services (CTS) has received an early Christmas gift in the form of two new DAF CF 6x2 rear-steer RCVs with Dennis Eagle trade waste bodywork ready for hire over the festive season and beyond. The 26-tonne DAF CFs were supplied by DAF Dealer, Greenhous DAF in Shrewsbury. The vehicles mark the end of a year of significant investment and fleet expansion at CTS, and the beginning of a new era of growth into commercial waste collection. The company has spent over £2.5m on new hire vehicles and now boasts a fleet of over 165 vehicles, including refuse vehicles, caged tippers, hook loaders, skip loaders and sweepers. The vehicles, which are now ready to hire, comprise DAF CF 290 FAN 6x2 rear steer chassis and Dennis Eagle Olympus 23 bodies fitted with Beta 2 Lip lifts. DAF Trucks’ CF 6x2 chassis continues its dominance of the municipal market, offering class-leading manoeuvrability and a range of axle configurations to suit the ever-increasing complexities of urban operations. CTS offers flexible and competitive refuse vehicle hire packages for the short or long term, and is part of contract hire and fleet management company Specialist Fleet Services Ltd (SFS).